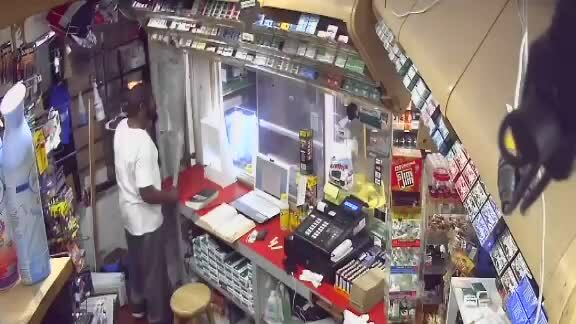 A store clerk fought back against a suspect with a knife. HUNTSVILLE, AL — A gas station robber armed with a machete was met by an unlikely match - a store clerk who also happened to be armed with a machete. According to local ABC news station WAAY , the incident occurred at a Conoco station in Huntsville, Alabama. Surveillance video from the store shows the suspect inside the store show a knife to the clerk. To his surprise, the clerk has a long knife of his own and tries to fight off the suspect while he locks the door remotely. The suspect then throws something through the door to get away while another suspect waits outside. The clerk goes outside and fights off the second suspect, a woman, and damages their getaway car. During the fight, all three reportedly suffered hand injuries and the store was also seriously damaged. WAAY says the suspects were later caught by police at a Burger King restaurant. They were identified as 33-year-old Laney Nicholson and 32-year-old Seth Holcomb. The suspects have multiple charges related to the robbery, WAAY says.